In order to get a good clean contact and a good clean note, a string must rest on a single point at the crest of a nice rounded fret. We all agree on that, right? Electric guitars such as Gibson's infamous "fretless wonders" may play adequately with low flat frets, but acoustics really don't work well with frets like that. These frets are so flat they will cause a light buzz and/or a dull, "fuzzy" tone. Even frets that are not as wide and flat as these can cause troubles. Believe it or not, the string can rattle on the flat portion of the fret just ahead of your fretting finger. A good test for this is to play just that one note and then press increasingly harder with your fretting finger. If the buzz goes away with super heavy fretting pressure, then chances are it's a bit too flat on top. Notice that my straightedge touches just a single point on the top of each of them. The best cure for flat frets is replacement with rounded ones. 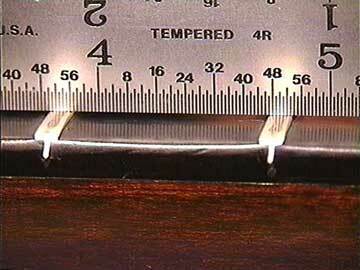 Leveling and rounding of existing frets makes sense if the frets are not going to end up too low. Time for a value judgment when it comes to determining how low is too low. 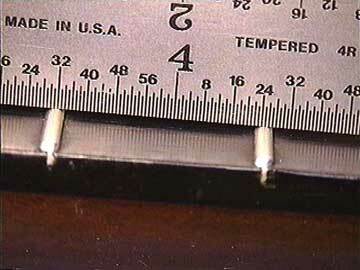 A fret that's become a little flat from wear can often be rounded successfully, where frets that were filed flat may just not be tall enough.